Adam has always been so interested in my sewing. He is is the only one of the children to only have known me as a mama with a machine and tons of fabric. He knows which scissors not to touch and, as all children of quilters know, he walks AROUND the quilt blocks or basting job that is right in the MIDDLE of the floor. This is normal for him. In an odd way, that makes me very happy. I was not surprised when he first asked to push the foot pedal while I was sewing nor was I shocked that he really likes to use charm squares to make different designs. This is his normal, he lives sewing. He is such a cutie. I love to see kids engaged in creative work. What a nice job he is doing too! That is great. Hi, Kim! 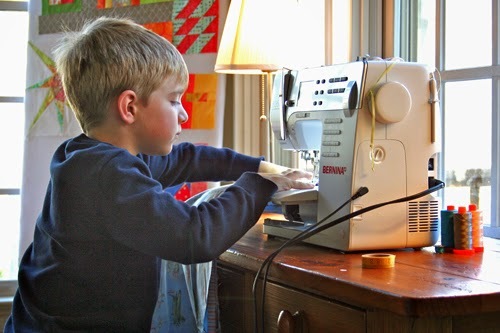 How wonderful that he enjoys sewing with his momma! Our oldest has always loved creating with fabric, but the younger two haven't shown much interest yet. I first became interested in quilting when our oldest was in her last year of preschool. The head teacher had each child make a small quilt, and let them run the machine, with assistance. With our youngest, at the same preschool, I helped the kids with their quilts this year, and enjoyed helping four and five year old's use a sewing machine. Some of them were really good at it. It looks like Adam already has the hang of it! Aw, so sweet! Thanks for posting this! My little guy has become more interested but I'm still nervous about letting him around my machine. Awesome post. My Israel loves to help me sew. He is waiting for his own sewing machine and tool belt to built things. oh yes get them whilst they are young!! I live in hope that my girls 42 and 38 and granddaughter 16 will one day show an interest in wanting to stitch! Oh I so understand this. Both of my kids have been clammering to make their won quilts and that prompted me to host The Primary Bee. They are loving making the blocks and Sunshine is especially excited when each of her blocks arrive from her bee mates. I know that she will be over the moon happy when they are all sewn together into her quilt. How cute! What fun having him sew. I have 2 boys and am hoping one of them will at least try it out. I saw your article about tips for sewing with children and found my way here. I was wondering how old Adam is. 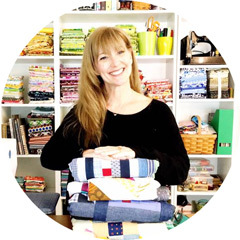 I am in a facebook group of quilters, Quilt Along with Pat Sloan, and there have been questions about teaching children to sew. Thought I would share the link to your excellent article with the group.